We’d love your help. Let us know what’s wrong with this preview of Travel and Street Photography by John Batdorff. Whether you're heading to Paris or San Francisco, Patagonia or Yosemite, you need a book that goes beyond the camera manual to teach you how to take great shots. This guide by pro photographer John Batdorff will help you conquer the fundamentals of travel and street photography and capture stunning pictures. Batdorff starts with the basics-composition, light, and exposure-a Whether you're heading to Paris or San Francisco, Patagonia or Yosemite, you need a book that goes beyond the camera manual to teach you how to take great shots. This guide by pro photographer John Batdorff will help you conquer the fundamentals of travel and street photography and capture stunning pictures. Batdorff starts with the basics-composition, light, and exposure-and how to plan and pack the right equipment for different types of shooting conditions. He also covers all the key camera features that affect your image. Once you've captured those shots, John takes you step-by-step through an effective workflow in Lightroom to organize your images and develop your own personal style. This guide is for beginning-to-intermediate digital photographers to understand the basics and bring their own unique artistic expression to any situation whether you're taking landscapes, cityscapes, portraits, or food and drink shots. To ask other readers questions about Travel and Street Photography, please sign up. Here John Batdorff walks a person who has bought a fairly decent camera (ideally DSLR or mirrorless) through all the typical situations one finds oneself in traveling or on a city street. The book is divided into the chapters “Equipment”, “Planning the Journey”, “Finding the Light”, “Composition”, “Observation vs. Engagement”, “Cities and Streets”, “Landscapes, Rural Life”, “The Legalities”, “Workflow”, and “Sharing Your Work”. 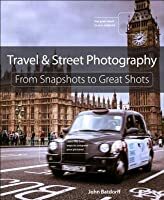 Generally the book assumes that the prospective traveler with a came Here John Batdorff walks a person who has bought a fairly decent camera (ideally DSLR or mirrorless) through all the typical situations one finds oneself in traveling or on a city street. The book is divided into the chapters “Equipment”, “Planning the Journey”, “Finding the Light”, “Composition”, “Observation vs. Engagement”, “Cities and Streets”, “Landscapes, Rural Life”, “The Legalities”, “Workflow”, and “Sharing Your Work”. Generally the book assumes that the prospective traveler with a camera has not yet learned much about how to actually use it, so many of the tips are general ones applicable to a wide array of photography contexts, but Batdorff tries to keep each tip rooted in situations that come up during travel or one the street. The book is lavishly illustrated with Batdorff's own photos, though they don’t come from all that many places, and Richard I’Anson’s Lonely Planet Travel Photography has a lot more variety, from all around the world, and is more inspiring. Çok geniş bir konu skalasını ele aldığı için konulara derinlemesine değinememiş. Daha dar bir konu seçimi ve daha fazla detay görmeyi isterdim. Konu hakkında giriş yapacaklar için oldukça iyi fikir verecek bir kitap. Love it so much. I had it to support a photography course. Nice tips and good to learn a bit about the photographer mental model! I really enjoy it. 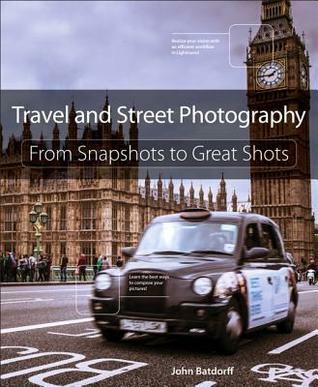 I loved this book, probably because I love to travel and I love street photography. My street photography is somewhat different than the authors but still, it was so enjoyable to read. I also found a few new tricks to try. I should have read this before I went to Toronto on vacation a couple of weeks ago, but I have Chicago coming up in September, so it will still be useful.